You absolutely must read the story in the link below. You must, I tell you. Here’s the letter from Mario Cacciottolo. It’s peppered with exclamation marks and sounds like something written by a schoolboy or a timesofmalta.com habitue’. The US state department found the incident amusing. Here’s their letter, and the photo which was a very great shock to us!! , according to KMB’s staff. The secretary seemed to like the word “grossly” and the use of exclamation marks. Great story, Daphne – I hope that the people who matter will have time to read it all. The man’s story is nice and simple and easy to follow. Thank you for bringing it up. Great story and I hate to be a stickler, but, a “battered old bus to Msida” in 2012? Everything else seems to check out though, particularly the veiled racism ingrained in our culture and the description of the 80s. This is hilarious (or should that be hilarious!!!!?). I wonder what Mario Cacciottolo BA DPA* has got to say about it all. I don’t know whether to say that this man was ahead of his time, or that nothing has changed since with these people!! Digging deeper and deeper – you must be really short of material. You have no idea, Martin. This post made my day. This is brilliant, Daphne. Thanks for the read. Great story, thanks for sharing. I encourage everyone to read both his blog posts related to this incident. Was this letter written by a German/Austrian? The Germans are very fond of using exclamation marks in any write-up!!!!!!!! I don’t know whether to laugh or to cry. I’ll bet that fool Cacciottolo took ‘mock’ in the sense of ‘jeer at’. Certainly the press in the US was much freer than the press in Malta those days. Thanks to Dom Mintoff’s anti-West rhetoric about “l-Ewropa ta’ Kajjin u l-Ewropa ta’ Abel”, most of the outside world took it for granted that before 1987 Malta was part and parcel of the Libyan Jamaharijah. That was my own experience during the Seventies and Eighties when I lived away from Malta. When I returned to Malta and became a regular subscriber to TIME magazine, I was forever inundated with adverts written in Arabic and meant for Middle Eastern consumers. Must also add that it is rather revealing that despite buddy-buddying up to LIbya and other African states, Karmenu’s lot objected vehemently to the Maltese being portrayed as dressing up “bhall l-Gharab” – as there is no other way of putting it. Sorry Daphne, didn’t realize you had already placed the link. Nice way to start the weekend. Great story. It really made my morning. Thanks for linking. I love the line “so called free press in your country.” I’m not sure that many stories were being written about Malta by the American press in 1986. Hence the void that led to that adorable Gaddafi costume. Things like this make me love your country so very very much. The whole story is hilarious, as well as David Seminara’s account of his trip to Malta. Good find, Daphne! The prime minister’s office was still using typewriters, when in the US children like David were already playing computer games. The Malta coat of arms was more like that of a banana republic. The telephone numbers were five digit, proving that the use of telephones on a Strouger system limited their use on the island. Thank God that “Ir-raba rebha” (fourth electoral victory) never materialised. Only a person who thinks in Maltese and writes in English would write ‘came to …’ to mean ‘amounted to’. The supposedly typewritten text of the reply from the OPM is fully justified, indicating that the letter was made by computer. For an administration which was so against the use of computers, it is highly unlikely that one was used by the secretary to the PM himself. I have copies of letters dated 25 August 1984 written by Mr J. Sammut, Administrative Secretary at the OPM, where the typewritten text is, understandably, left justified. Another point: All correspondence issued by the OPM used to bear an OPM number, typed alongside Our Ref. at the top left hand corner of the letterhead. I’m sure that it wasn’t you who thought out this little piece of fiction, but I hope that you haven’t been duped into believing that it’s true. After all that’s been said and written, however, I must say that I enjoyed the humour. 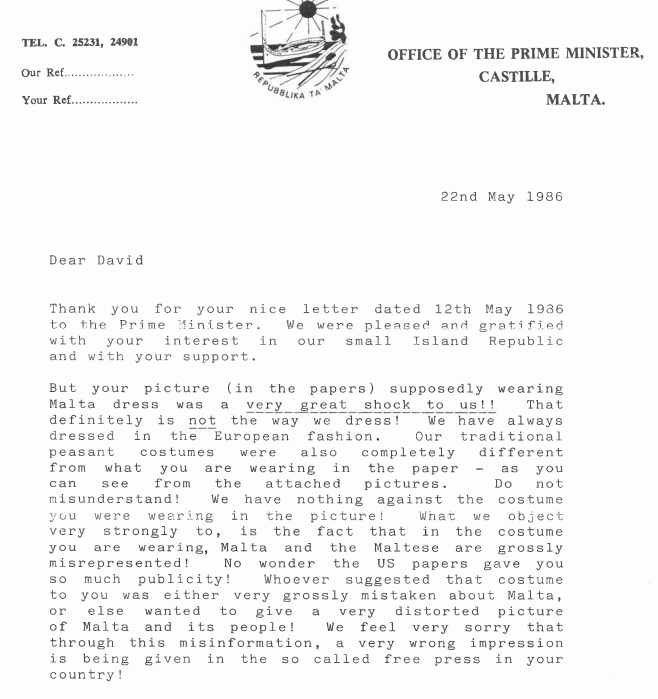 Why would anyone go through the elaborate fraud of creating a fictitious persona, complete with a personalised website and email address, showcase a repertoire of published work and dozens of photographs, for the sole purpose of ‘manufacturing’ a story to tell the world of Malta’s political incompetence and hysterical chippiness in the 1980s? Why, if Dave Seminara tuned into Al Jazeera and Smash he could have seen Karmenu Mifsud Bonnici telling the world what he still thinks of Libya and the EU. “we have always worn European fashions”. In 1980s Malta? Please. There’s a contact link on the site. I’m sure Dave Seminara would love to hear from another Maltese crank. A perfect pair of bookends: one who thought Seminara was a threat to Malta’s dignity, and another who thinks he doesn’t exist. Oh, and you’ve clearly never taken typing lessons, or you’d know that right-justification was an acquired skill. What a great story this is. If you address someone by name in a letter, you end it ‘Yours sincerely’ not ‘Your faithfully’. This was English lesson one when I was a school boy in the sixties. Now we say ‘Hi’ in letters it seems. And those exclamation marks are an embarrassment. I’m really surprised to think that someone believes that I could have actually made that letter up! Crazy! I still have the original- that’s a scanned copy. Along with the letter, they also sent me two books about Malta and a photo of Bonnici. I still have the books but have lost the photo. (Though I remember that he was NOT smiling). If anyone doubts my story, drop me a line I’m happy to verify every line! [email protected] And by the way, I love Malta and plan to return for a longer trip next time. Most of us have no doubts in our minds about the authenticity of this story. Yet, others are in denial that they actually voted such fools into office and prefer to conjure up conspiracy theories than face facts. Did you say you lost the photo? Then you’re lucky. We had to put up with the real thing for years and he still pollutes our TV screens occasionally. No. He doesn’t smile in official photographs. He gloats. One other note: The scanned copy of the letter at the top of this page is just page 1 of the letter, there’s a bit more on Page 2 along with Mario’s signature, which I obviously haven’t forged. Great stuff. As you said, Daphne, one simply couldn’t make this story up. Minghalija il-PRO ta’ KMB kien is-Sur Baghbas tal-Mellieha, li kien jahdem l-Air Malta, l-istil ta’ kitba huwa tieghu. Had Dave encountered the likes of ‘Carmen’ Mifsud Bonnici, he wouldn’t have ventured so far as to be obsessed in apologising and making amends. How backwards we were, jahasra.